openSUSE 10.3 is Here! Bye-bye Vista: The moment I and possibly a huge number of Linux users have been waiting for has arrived. 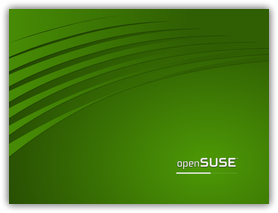 After almost a year of silence, Novell announced today the release of openSUSE 10.3. From the release announcement, this latest version contains new beautiful green artwork, KDE 3.5.7 and parts of KDE 4, SUSE-polished GNOME 2.20, a GTK version of YaST, a new 1-click-install technology, MP3 support out-of-the-box, new and redesigned YaST modules, Compiz and Compiz fusion advances, visualization improvements, OpenOffice.org 2.3, Xfce 4.4.1, and much more! These are some of the stunning screenshots I got from their website. 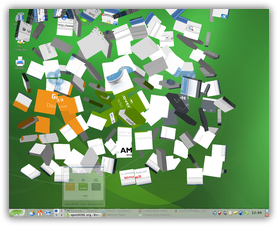 Have been happily using openSUSE 10.1 on my main workstation for a long period of time now. That is why I’m very much excited to try out this new version already. I feel like an Apple fan boy waiting in line just to get latest iPod as early as possible. But I still have to be patient because it will take about 2 days to finish downloading the massive 4GB ISO. Looking at those screenshots made me wish I had a faster internet connection. I just hope it’s worth the wait and this new version will deliver as promised. 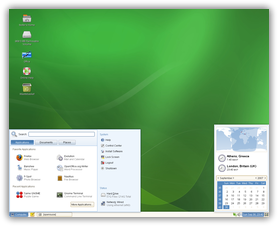 You can get OpenSuse 10.3 here. I am a former SUSE user. I wish I could get exited about this as I used to, but I cannot support a distribution produced by a company that agrees to enter into a pact with MS that threatens all Linux developers not joining it. That may not matter to some of you, but for me it is important that the distro I support is a good free software community member that doesn’t just look out for its own selfish ambitions. Fortunately, there are excellent alternatives out there. Go to distrowatch.com and explore some of them. I agree with Anonymous above. I was an openSUSE user before, but on the day that Novell decided to agree to pay the extortion money to abusive monopolist Microsoft they have lost me. There are as good distributions out there (currently I use Mandriva and Kubuntu) and they are even better as theay are the true Linux team players, unlike Novell. This is a free world and we are free to choose whatever OS we want to use. Linux will never be threatened by Microsoft or Novell. If Linux will continue to strengthen then nobody can touch it. Microsoft should fear Linux and not the other way around. A CD is easy to download but the day my ISP decides to play tricks on me, I'll find it tough to add packages. In contrast, the DVD took me almost 8 hours to download but it contains most of the software I need. Firefox print preview crash...I actually fixed it by downgrading gtk2 from 2.12 back to 2.10. Well about opensuse, ease of use and server wise too. Ubuntu and PCLinuxOS are good too, but I'll stick to opensuse, I works for me. and 100 workstation I've been managing.